James Neiss/staff photographerWheatfield, NY - Firefighters, from left, Lt. Vince Muscarella with Engine 31 in Buffalo and Capt. 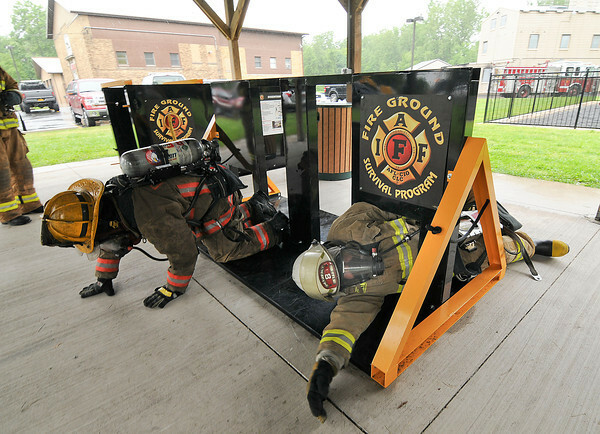 David McGovern with Engine 8 in Niagara Falls, squirm their way through small openings in the Wall Breach practice station, part of the Fire Ground Survival Program. Firefighters and trainers from around the US and Canada participated in a training exercise at the Frontier Volunteer Fire Hall on River Road.